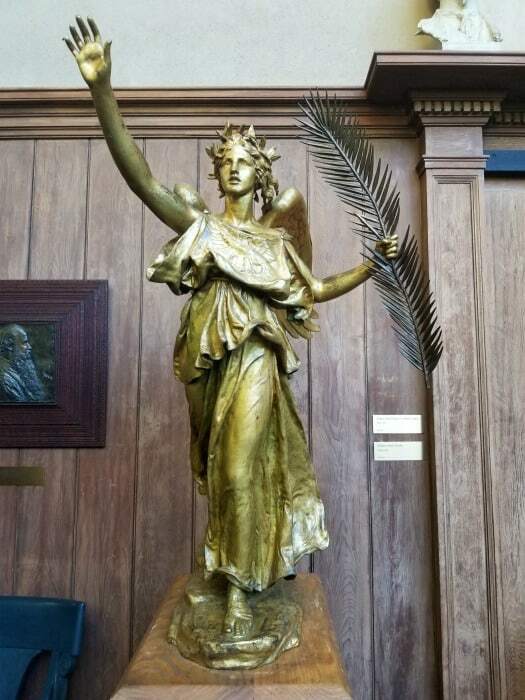 Augustus Saint-Gaudens is considered one of Americas finest sculptors. He was the designer of the double eagle gold coin that is considered one of the most beautiful coins minted in this country. 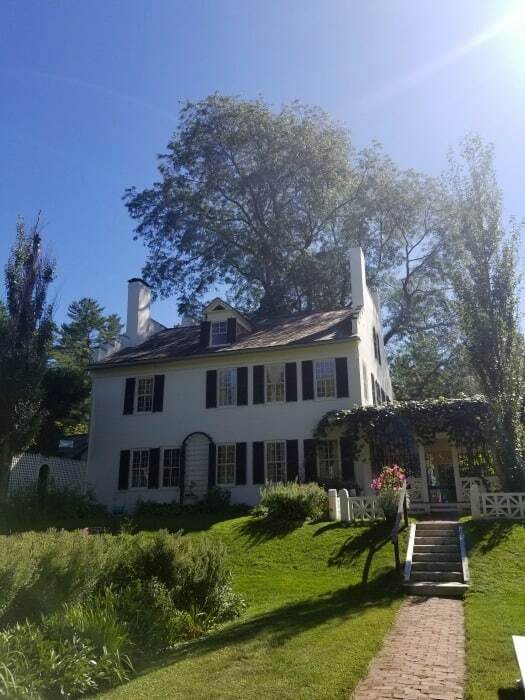 Saint Gaudens National Historic Site is the homesite of Augustus Saint-Gauden in New Hampshire. The grounds include his home, Aspet, gardens and over one hundred of his sculptures are on display. 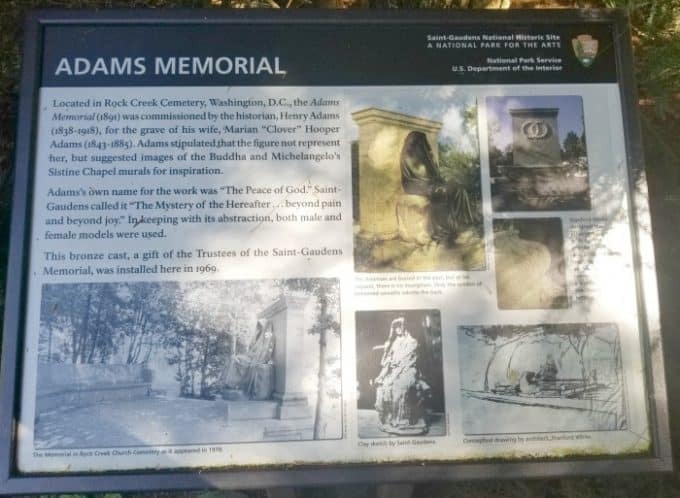 One thing we learned visiting Saint Gaudens NHS is this park is great for an afternoon of wandering around and exploring. Make sure and wear shoes you are comfortable walking in grass in and give yourself enough time to explore. We thought that this park would maybe take an hour or two at most and we honestly could have spent a lot longer wandering the park. There is not a ton of shade so make sure you have sunscreen, a hat, sunglasses and water with you. 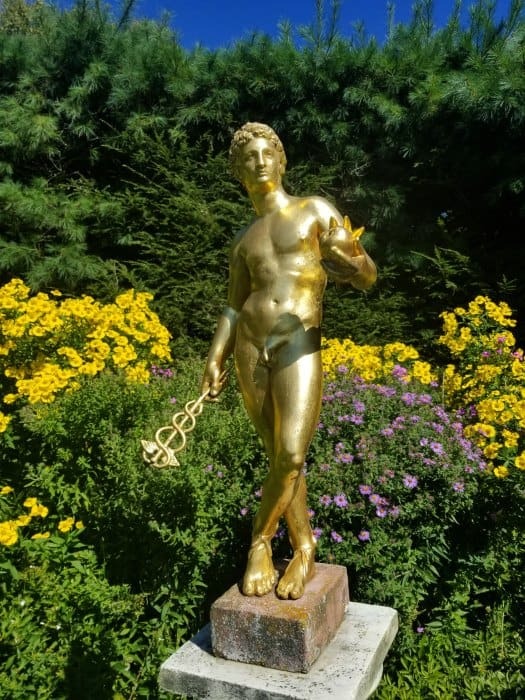 There are Saint Gaudens sculptures spread around the property so it feels like a bit of a scavenger hunt to find them all. 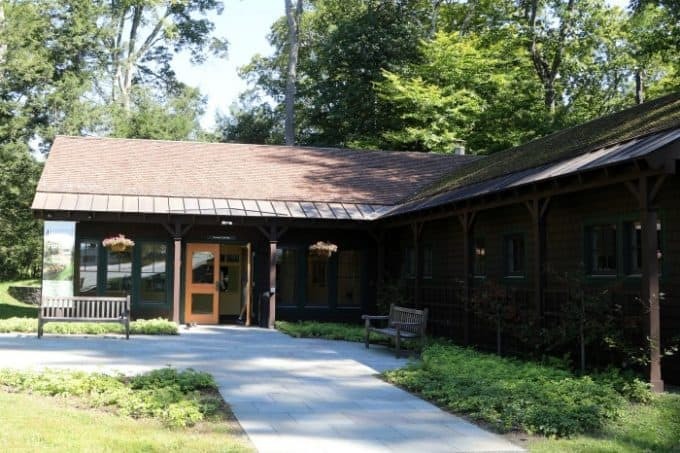 The visitor center is the best place to start your tour of Saint Gaudens NHS. You can pick up the sticker that shows that you have paid or have a pass to enter the park. You can also sign up for the ranger guided tours. You can pick up some works of art and local Vermont maple syrup at the gift shop. There are a couple of films offered at the visitor center. We watched the introduction to the life and work of Augustus Saint-Gaudens and it was dry but filled with a ton of info. Children may have a hard time sitting still for the entire film. – The park orientation film. Shown throughout the day. Wax Blood, Bronze Skin (25 minutes) * Shown on request. 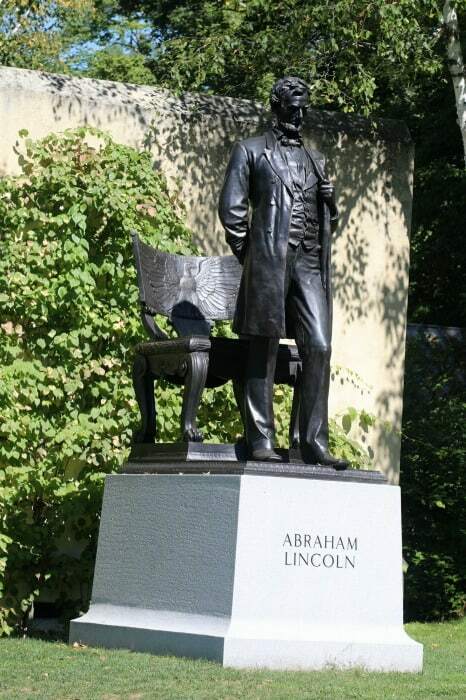 Explains “lost wax” bronze casting using film of the 1994 casting of the Park’s monument to Admiral Farragut. The Medal Maker (25 minutes) * Shown on request. 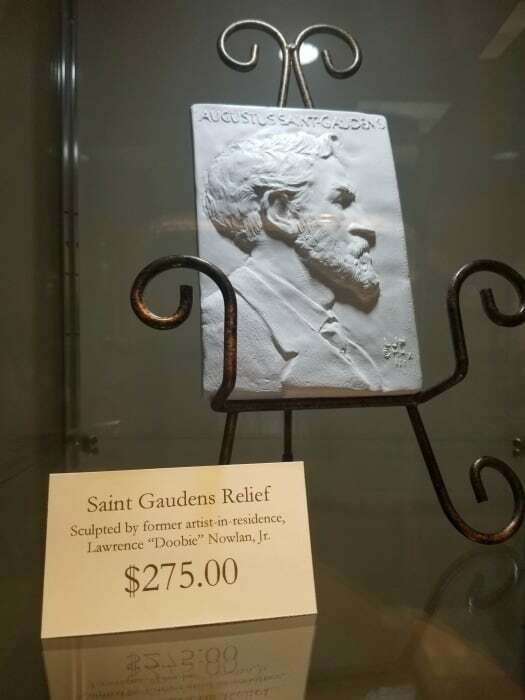 Sculptor, Laura Gardin Fraser, demonstrates the process of medallic art. Junior Ranger pin depicting the Dianain silhouette, created by Saint-Gaudens in 1892. 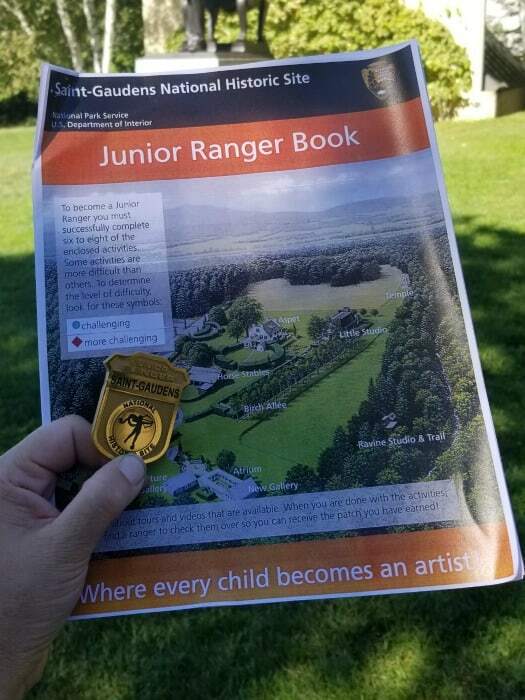 The Junior Ranger program includes visiting the sculptures found on the property along with some puzzles and matching games. A free App for iPhone and Androids is available for touring the park. We wandered around the park and it was fantastic. 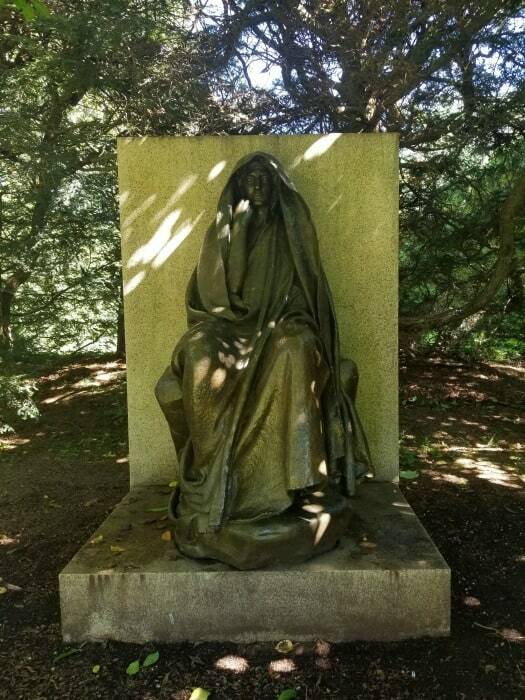 Make sure to look in between the hedges to see more of Saint-Gaudens sculptures. Self-Guided Tour of ASPET – 10-11: 45 am & 1-4pm; Subject to staffing availability. 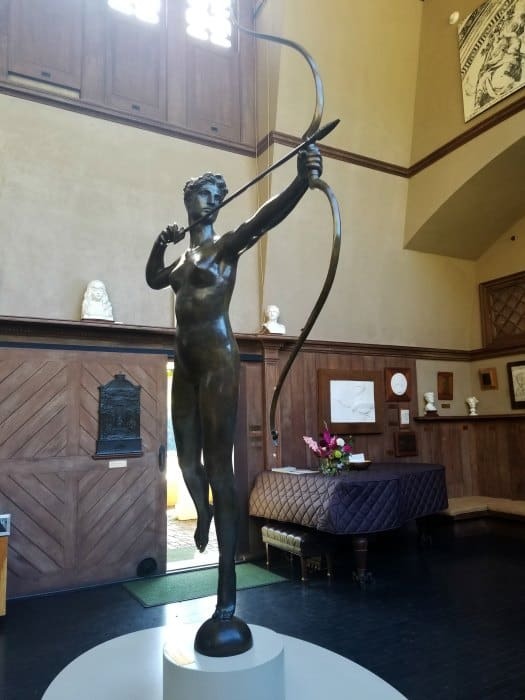 Explore the home of Augustus, Augusta and Homer Saint-Gaudens at your own pace, with staff present to answer questions. Only 12 people are allowed on this tour at a time. Aspet is not wheelchair accessible. Ravine Trail (1/4 mile) meanders along Blow-Me-Up Brook and by the swimming hole constructed by Saint-Gaudens. There is a steep slope at each end of this trail, though the main section is fairly level. Blow-Me-Down Trail (1-1/4 mile round trip) takes one down to the mill pond and back along the edge of small ravines left by the receding glacial lakes. Return Trail section of the Blow-Me-Down Trail (an alternate route back to the lower field) can be steep in sections. 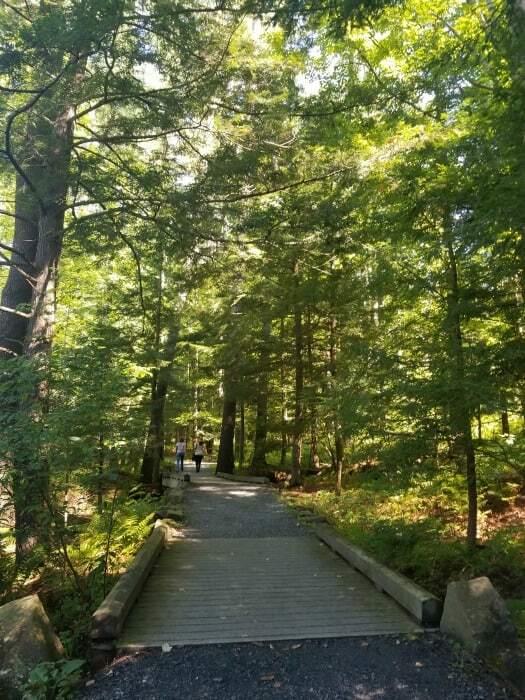 There is a short walk/trail from the main parking lot to the visitor center. ADA Parking is available closer to the visitor center. The trail is crushed rock and flat most of the way. The Visitor Center is open daily from Memorial Day weekend through October. From November through mid-May, the Visitor Center is usually open Monday to Friday for limited hours. November through late May, the exhibit buildings are closed, but the grounds remain open during daylight hours. Children 15 and under are always free.